Steven Mullaney will be hoping to inspire a fightback on Wednesday when he leads his side out at Kensington Oval in the second match of the ECB’s North v South series. The Nottinghamshire all-rounder top-scored with 57 runs from only 40 deliveries in Sunday’s first match but saw his side still come up 63 runs short. Mullaney, 31, is captaining the North in this three-match series, a huge accolade for one of the most consistent white ball performers around. 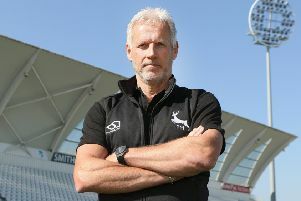 Ahead of his first season in charge at Trent Bridge he is relishing the opportunity of showing what he can do on the representative stage but his side were heavily out-gunned under blue Barbados skies in the opener. A century from Middlesex’s Nick Gubbins and fifties from Daniel Bell-Drummond and Delray Rawlins powered the South to a total of 347, the largest one-day score ever made on the ground. “We’ve sat down as a group and the lads have and admitted we didn’t quite get it right with the new ball,” conceded Mullaney. “But you also have to give credit to them as well; I thought Bell-Drummond and Gubbins played really well. Mullaney and Worcestershire’s Brett D’Oliveira shared a stand of 89 in just nine overs to give the chase some late-order impetus, a stand that gave the Nottinghamshire captain some food for thought. Sunday’s match clearly demonstrated that this is anything but a succession of routine pre-season friendlies, with both camps desperate for victory. Mullaney was due to be one of two Notts players in the North squad with Paul Coughlin, but the county’s new signing from Durham is now facing a lengthy absence after surgery on the shoulder he dislocated playing for the England Lions in Antigua earlier this month.